This is such a multi-faceted exhibition. 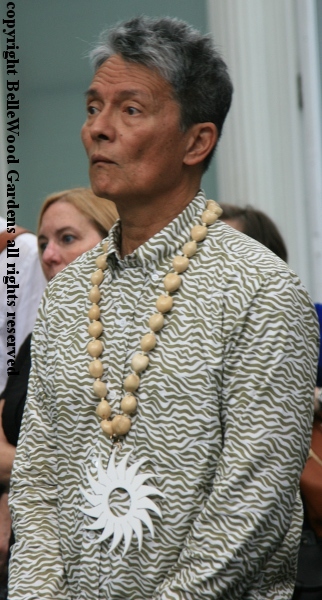 There is the Hawaiian plants exhibition in the Enid A. Haupt conservatory. Paintings in the gallery and art on the grounds. Let's start at the top, on the sixth floor, then work our way down to the fourth floor, and then outdoors. Come on, it's worth it. You'll see. 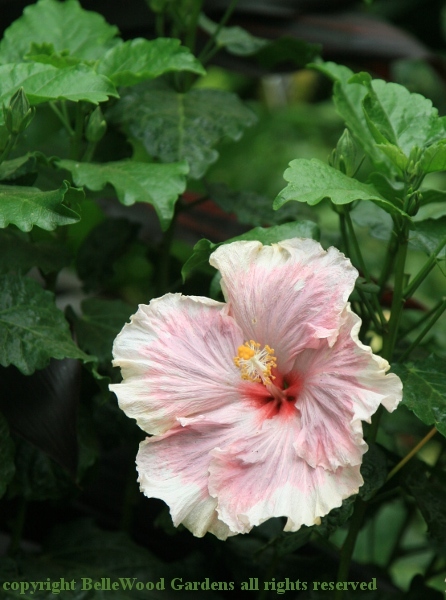 A delicate, pale pink hibiscus in the conservatory. 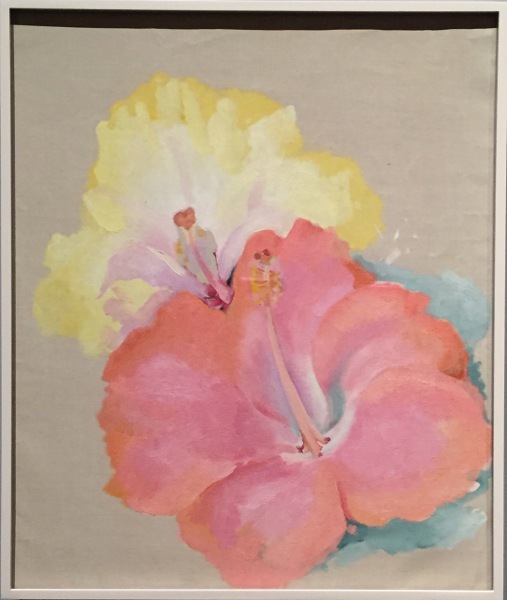 An O'Keeffe painting of two hibiscus in the gallery. of flora and landscape greater than she anticipated. 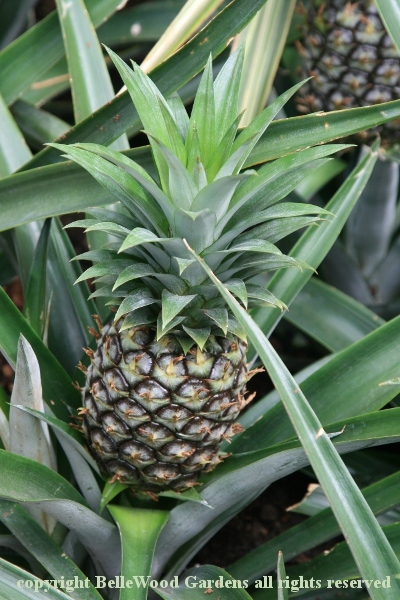 We find pineapples commonplace in today's grocery stores. It was different in 1939 when they were exotic rarities. 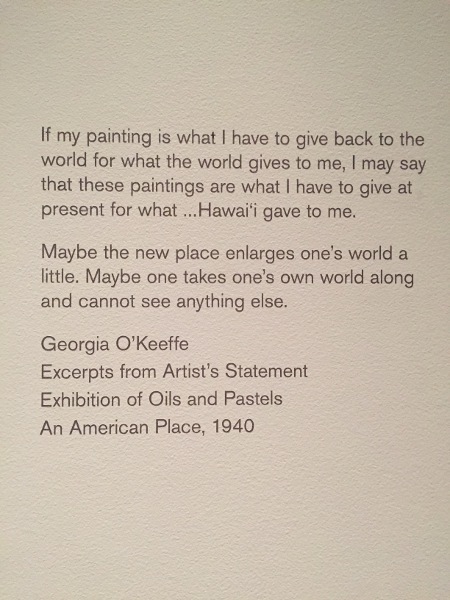 O'Keeffe's painting Pineapple Bud was actually done after she had returned home. 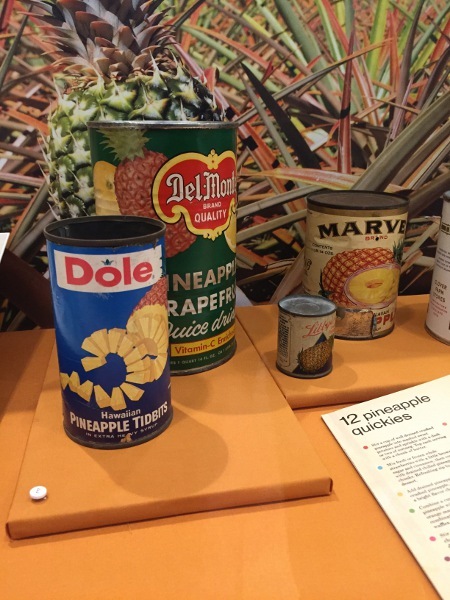 Dole Pineapple Company shipped a plant, by air, 36 hours in transit, since she had not painted one while in Hawai'i. 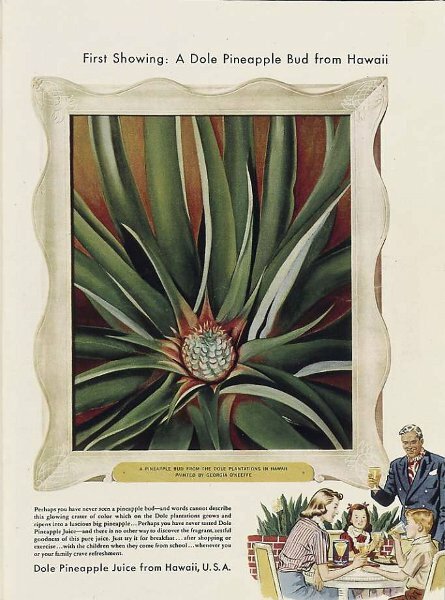 And here is the advertisement in which the painting was used. You can see an actual magazine on display in the library's rotunda. offered this rare and exotic fruit and its juice for sale. 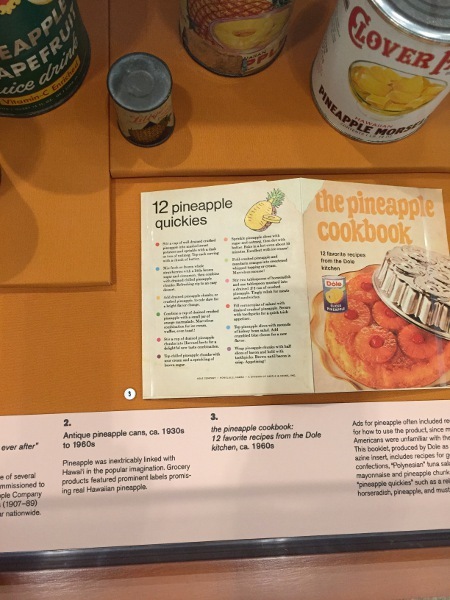 a simple pineapple recipe booklet was created. Heliconia stricta 'Fire Bird' in flower. Very exotic. it is the second painting to be used in an advertisement. 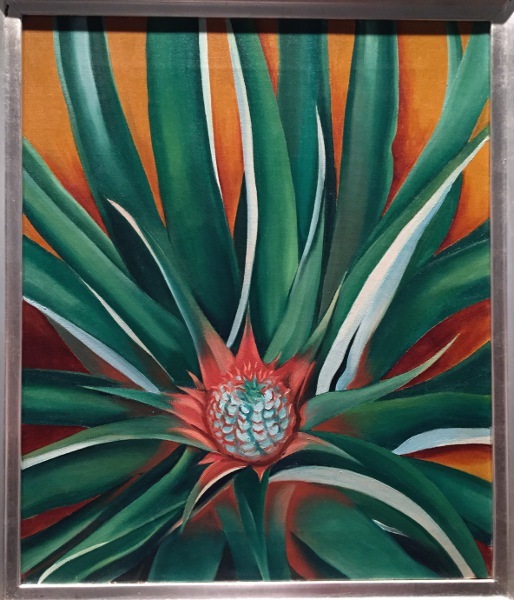 Heliconia continues as artistic inspiration today. a monumental, 13-foot, stainless steel sculpture in the reflecting pool. And wears a 2-dimensional version as a pendant. 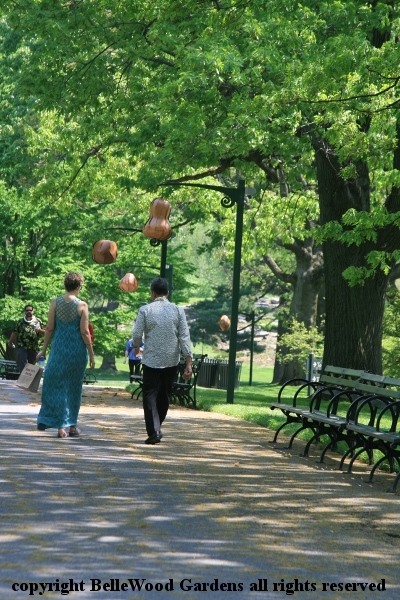 Mark and Makana walk down Garden Way, wooden lanterns he designed, their shapes meant to evoke native Hawaiian canoe plants gently shifting in a breeze, the lantern armature's shape echoing the furled shape of a fiddlehead fern. Origami - not quite. 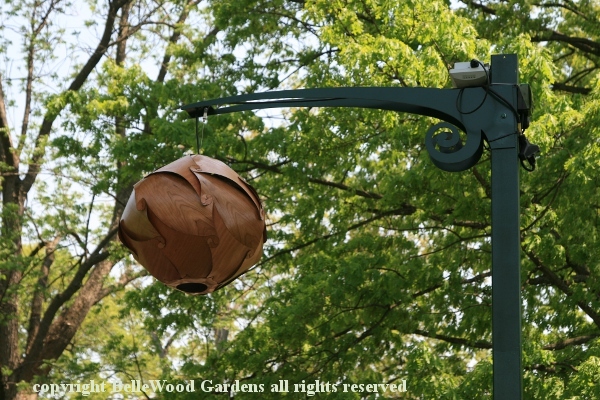 But a delicate folding of wood to shape each lantern. What a wonderful day. 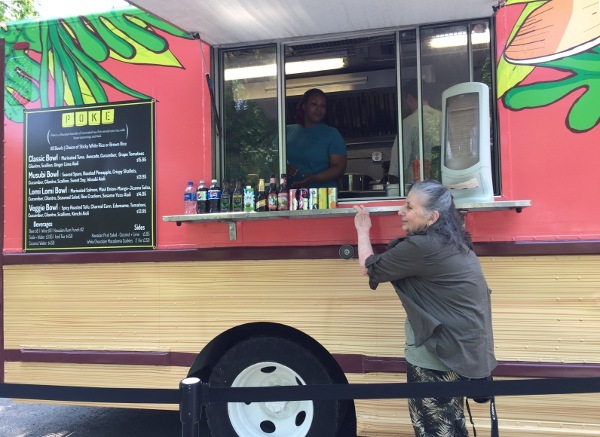 I shall re-energize with a bowl from the poke truck.